I have experimented with a few different ways to eat. I won't say diet because that feels like a short-term effort or fad. I eat food and see how my body reacts. If I feel lethargic and ready for a nap after eating something, then I know that my body isn't a fan. Likewise, when I eat a meal and feel energized and recharged, then I know those are good ingredients for me. Over this past year, paleo has really felt good for me, so I was thrilled to see the opening of the paleo-focused Primal Kitchen Restaurant in Culver City. Primal Kitchen is a paleo/keto brand that Mark Sisson created featuring clean eating products that follow his Primal Blueprint. What that boils down to is food that's gluten free, dairy free, and sugar free - exactly how I like to eat. So imagine my delight at having an entire restaurant where I can and want to eat everything on the menu. There's no need for substituting or special orders for me at Primal Kitchen Restaurant. Paleo also means healthy meats. Primal Kitchen Restaurant uses meat and produce that's USDA certified organic and local. They also use non-GMO products whenever possible, and no processed oils. So on the breakfast menu there are free-range eggs with bacon and sausage. Primal Pancakes are made with coconut flour, almond flour, and vanilla Primal Fuel, a low carb, high protein powder. You can purchase Primal Fuel in the Primal Goods section of the restaurant, along with the award-winning avocado oil based mayonnaise. Most of the Primal Kitchen products can be found here, along with other healthy snacks, crackers, bars, and drinks. It's one-stop healthy eating hub. You can read more about Mark Sisson and his paleo and keto work in my interview with him here. You order at the counter at Primal Kitchen Restaurant and your food is brought to you. It's a casual spot with patio seating to watch the goings-on in Culver City. They serve kombucha on tap, as well as Omission beer and FitVine wine. Omission beer is gluten free and FitVine is a low sugar wine with low sulfites. That's a win-win across the board. You may also want to choose one of their homemade broths like the Primal pick-me-up with beef broth, sweet potato puree, curry powder, collagen protein and sea salt, or the Cold Buster with chicken broth, garlic - ginger chile powder and lemongrass. There are healthy smoothies and juices as well. Lunch and dinner have a collection of entrees, bowls, and salads. You can start with some bison chili or a mixed yellow beet salad with fennel, citrus, and a honey mustard vinaigrette. The meatless eggplant "meatballs" have a light texture and smooth taste that's accented by a tomato pomodoro sauce and creamy pistachio pesto. You can build your own bowl from a collection of proteins, vegetables and grainless bases like cauliflower rice, roasted yams or parsnip bone marrow mash. There are also pre-assembled bowls like the Texas BBQ Bowl with grilled chicken, caramelized onions, and pickled beets served over roasted yams. I loved the slow roasted beef and pork ragu over spaghetti squash. Who needs gluten filled spaghetti when you have this healthier, nutrient-rich dish that tastes amazing. I thought the spaghetti squash ragu was my favorite dish at Primal Kitchen, until I tried the chili. Since the chili is paleo, it's beanless, which makes me so happy. That's just a big bowl of really well cinnamon and pepper spiced bison chili. Yes, I said bison. It's fabulous and I may need to go back soon to get some of that to go. The chimichurri skirt steak sits on a creamy, cream-less base of parsnip bone marrow mash. The charred green onion salsa pairs nicely. 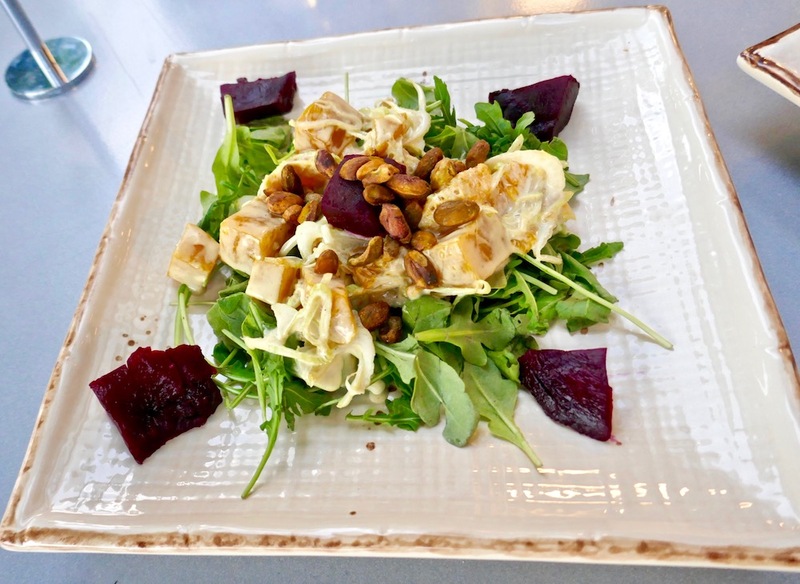 While Primal Kitchen doesn't offer a romantic or high-end dining experience, it does offer quality clean eating food for people with food allergies or those who want to eat healthier. You can read more about Mark Sisson and his paleo and keto work in my interview with him here.